A far-right group which first surfaced on the same day that Scottish Dawn were banned under terror laws has announced a “march against far-left thugs” in the centre of Glasgow on Bonfire Night. Neo-nazi group National Action were themselves banned in December last year, following their glorification of the death of Labour MP Jo Cox, becoming the first ever far-right group to be banned in the UK under terrorism laws. 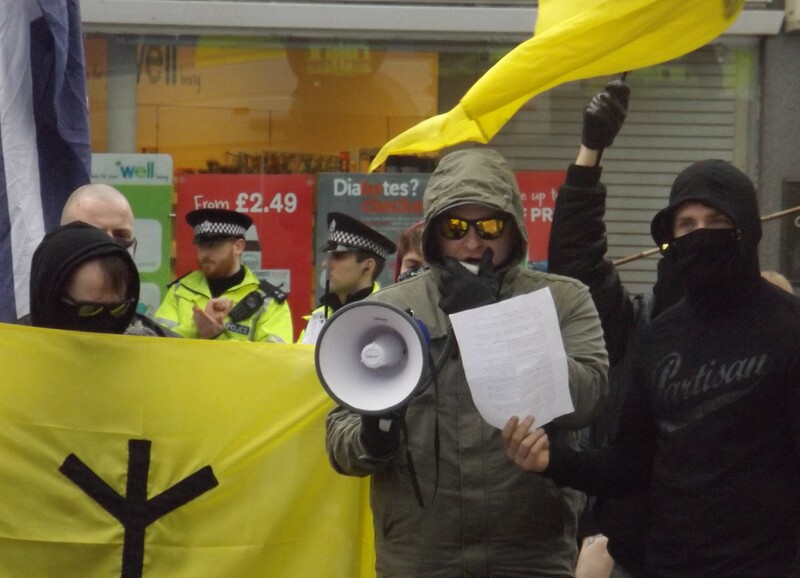 When similarly dressed figures began organising under the name “Scottish Dawn” earlier this year, first appearing with distinctive yellow runic flags at a Scottish Defence League demonstration in Alloa in March, it was suspected that they were the same organisation under a different guise, as we reported in our write-up from that day. But those fears were later confirmed by investigative site The Ferret, who sent a reporter undercover with the group. In secret recordings, their organisers admitted working with former-NA members. This then culimated in the Home Office banning the group on 28 September. In spite of the attention lavished on them by the state, Scottish Dawn never achieved much during their short period in existence, with their membership barely reaching double figures. What they did do was go for a couple of hikes in the Scottish countryside, and tag along to some SDL demonstrations in Alloa, Wishaw and Perth. Last Line Resistance, and another group which has also appeared in recent weeks under the name “Scotland First”, seem to be promising much the same. “We’re organising a hiking trip, Contact us for more information,” was how Scotland First initially announced their presence on Twitter. “The LLR will be attending the next confirmed SDL demonstration, if you would like to get involved, feel free to DM us.” was the second pronouncement from the Last Line Resistance account. 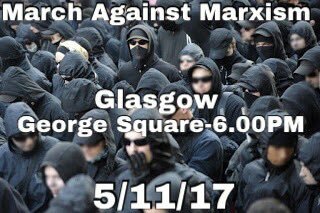 However, clearly eager to get moving with their new organisation(s), and with no SDL demos on the horizon at present, the groups have announced a Glasgow convergence for Sunday 5 November, dubbed the “March against Marxism”. Supporters are told to dress in black and bring “non-sectarian flags”, whatever that means. Bonfire night is one of the busiest nights of the year in the city centre, with thousands descending on nearby Glasgow Green for the fireworks. The last few years have also seen a cringey “Million Mask March” take place in George Square although it doesn’t appear to be planned for this year. 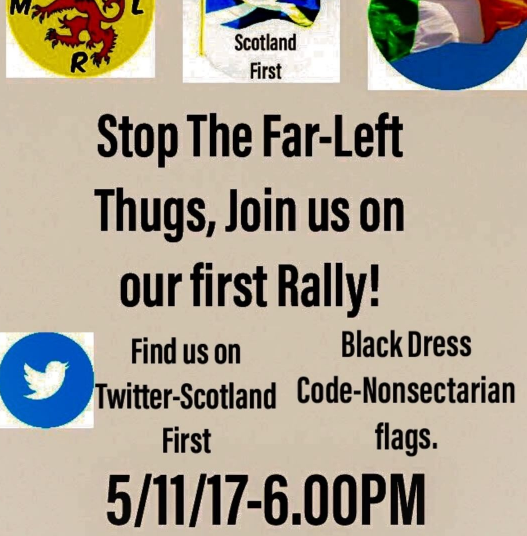 Last Line Resistance, the account which was set up on the day of Scottish Dawn’s ban, state that they are “mostly active in Ayrshire.” Ayr was a known hub of National Action activity, with neo-Nazi stickers appearing around the town centre and the UWS university campus last summer. Connor McKechnie, 18, appeared in Ayr Sheriff Court this June and was sentenced to 120 hours community service after pleading guilty to causing fear and alarm with the stickers. ← Did the Daily Record Force a Syrian Refugee Family to Flee their Scottish Home?